Critically acclaimed pianist/composer Gabriel Guerrero comes from a new generation of contemporary musicians emerging in the Jazz scene. Addressing music for its drive, direction and roots rather than styles, Gabriel has gone from South American rhythms, Contemporary Improvisation, Avant Garde to the traditions of Be-Bop and Jazz. Gabriel exalts his music with a high understanding of its roots bringing his experience and diversity to the table. Born in Colombia and based in New York City for almost sixteen years, Gabriel began his classical training at age five, giving concerts and TV appearances at age nine, Gabriel have performed in Jazz Festivals in South America, USA, Asia and is a high demand musician in the scene today. On 2012 “FEYAS” is the new released album on Surca Music, featuring seven original songs and 2 arrangements. Musicians on the album include the Gabriel Guerrero Trio featuring Jorge Roeder-bass, Eric Doob-drums, plus other line ups including Jerry Bergonzi-sax, Bruce Gertz-bass, Samuel Torres-percussion among others. The album contains songs with Colombian rhythms such as Porro, Bullerengue, as well as contemporary jazz songs showcasing Guerrero’s strong intellect and versatility on his writing and arranging. All About Jazz review of the album says, “He is well on his way to staking out a claim as one of the rising pianists in contemporary jazz.”As a sideman Gabriel can be heard on the recently released Bruce Gertz Quintet recordings “Reptilian Fantasies” and “It Wasn’t Me” featuring Jerry Bergonzi, and “Panama Suite” (Artist Share 2008) by the Danilo Perez Big Band featuring Danilo Perez on electric piano and Gabriel on acoustic piano plus a 19-piece big band. He has performed with Paquito D’ Rivera, Dave Holland, Steve Coleman, Roy Hargrove, George Garzone, Mike Mainieri, Esperanza Spalding, Adam Nusbaum, Dafnis Prieto, John Riley, Mike Clark, Bob Moses, Michael Spiro, Anthony Branker, Gregg Bissonette, Michael Wimberley, Jamey Haddad, and recently performing regular gigs with the Jerry Bergonzi and the Bruce Gertz Quartets.He has also put together various musical projects such as SURCA, a multi-cultural quartet dedicated to expanding on South American rhythms and avant-garde jazz. 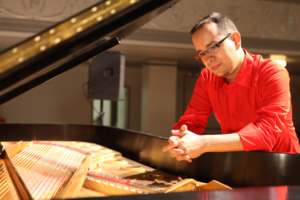 In Colombia, Gabriel studied classical piano from age five before moving to New York in 1998 to study at Hunter College winning the Concerto/Aria Competition performing Mozarts Piano Concerto K444 with the Hunter Symphony Orchestra. In year 2000 Gabriel won a scholarship to study at The New England Conservatory earning both a Bachelors and a Masters degree studying with Danilo Perez, Steve Lacy, Fred Hersch, Jerry Bergonzi, and Charlie Banacos. In 2004, Gabriel was selected along with other fourteen musicians from the United States to be part of The Steans Institute for Young Artists Jazz Program at Ravinia Festival. Other teachers include with Ran Blake, James Moody, Rufus Reid, George Russell, and Joe Lovano. , Inc, Outpost Performance Space, Ibeam, Jordan Hall, Sala de Conciertos Luis Angel Arango, Luis A. Calvo Concert Hall, as well as taught clinics at Berklee College of Music, New England Conservatory, and Universities in Colombia such as EAFIT University, Escuela Fernando Sor, Centro de Educacion Musical de Bucaramanga, Universidad Industrial de Santander among others.